"Be Bold. Be a Viking." 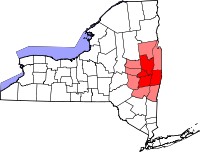 Hudson Valley Community College is a community college in Troy, New York. It is associated with the State University of New York (SUNY). Although about eighty percent of the students are from the local area, the remainder are from other parts of New York, other states and from some 30 countries around the world. The school currently has an enrollment of 10,896 students. Near the Marvin Library Learning Commons entrance at Hudson Valley Community College. Brahan Hall quad. The "old quad" at Hudson Valley Community College. Guenther Enrollment Services Center in the background. The college has a collaboration with SUNY Plattsburgh to offer a 4-year degree (Bachelor's) in Criminal Justice at HVCC's Capital District campus. The college also offers a BS in Human Services through Cazenovia College, through a part-time evening program on the grounds of HVCC. This is the only Human Services B.S. degree offered in this format in the Capital Region. HVCC Board of Trustees. From left to right: Trustee Wane Pratt, Secretary George Raneri, Trustee Joseph Kapp, Trustee William Fagan, Former Trustee Manik Elahi (at the podium), Chairman Neil Kelleher (standing behind Trustee Elahi), Trustee William Jennings and Trustee/Hon. Judge Conrad Lang. Absent from the picture: Trustee Brian Zweig, Trustee Catherine Conroy and Trustee Judith Bresselor. Hudson Valley also offers three Honors Advisement Tracks, which include specialized curriculum in the liberal arts, math and science and business administration, designed to prepare students for transfer to higher-level baccalaureate programs. Students who successfully complete the program receive Completion of Honors Study documentation upon graduation. The college also oversees several other academic and training entities, including the Capital District Educational Opportunity Center and the Workforce Development Institute. The Marvin Library Learning Commons supports the college's academic programs through its collections and services. The library provides over 100,000 volumes in print, microform, and electronic format. In addition, the library provides access to over 30,000 journal titles through a range of print and electronic journals. Research databases are available to all registered students and faculty and staff from the library and from off-campus. Faculty librarians are available to provide reference services and individual research consultation by appointment. The library sponsors the popular Voices lecture series with over a dozen speakers on topics from the arts, politics, and contemporary issues in the community. The college's archives are stored in and maintained by the library. The Student Senate is the elected student government on the campus, which is elected from within the student body. The Student Senate at Hudson Valley Community College, with administration and faculty guidance, assumes the responsibility of promoting and coordinating student affairs and student life, authorizing the establishment of new clubs and activities, promoting student welfare and assisting with the annual budget which supports the extracurricular program of over forty-five different activities. The college currently offers intercollegiate sports for men and women. Teams compete in Region III of the National Junior College Athletic Association (NJCAA) and in the Mountain Valley Athletic Conference. The college's teams have won national championships in ice hockey (2001), men's cross country (1996), women's bowling (1995, 2010), women's basketball (1993) and women's alpine skiing (1977). Growing out of the Veteran's Vocational School in downtown Troy, New York in 1946, the college was founded in 1953 as the Hudson Valley Technical Institute. Initially, the role of the college was to provide practical hands-on vocational training for veterans returning from World War II. Dwight Marvin, editor of the Troy Record, was one of several community leaders who pressed to create a broader mission for the college, which in 1959 would be officially known as Hudson Valley Community College. Marvin served as the first chairman of the college's Board of Trustees. The college initially was housed in the former Earl and Wilson shirt collar factory building at Broadway and Seventh Avenue, but by 1955, the board of trustees was already looking for a larger location to site a campus. The trustees surveyed likely sites for a new campus and in 1956 announced that the Williams farm, which straddled the Troy-North Greenbush border, would be the chosen site. The new campus was initially opposed by a group of Rensselaer County taxpayers, who argued that the county should not have to pay for half the cost of the campus construction if fewer than half the students were county residents. What would become a landmark case for community colleges in New York State eventually was heard by the state's Court of Appeals. On June 25, 1958, the court upheld the county's right to fund half of the cost of construction and paved the way for capital construction at community colleges around the state. The new campus, with five Indiana limestone buildings, was completed in 1961 and the former factory building was abandoned and eventually torn down. Otto Guenther was selected in 1953 to be the first president of the newly established Hudson Valley Technical Institute. In 1957, President Guenther received approval from the Rensselaer County Board of Supervisors to begin construction of a new campus on the border of Troy and the town of North Greenbush. That transition to a newly created suburban campus and the growth of the student body were Guenther's legacy as president. James Fitzgibbons presided over impressive growth in the college's student body and in the number of academic programs offered. During his tenure, Hudson Valley's curricula grew from 18 to 38 academic programs. Five new buildings on campus also were completed during the Fitzgibbons presidency. The Fitzgibbons Health Technologies Center was dedicated to the president in 1982. The longest-tenured president of the college, Joseph J. Bulmer served Hudson Valley for 17 years. A nuclear engineer with a distinguished career at General Electric, Dr. Bulmer was responsible for increasing the college's image in the Capital Region. The establishment of distance learning, a Center for Effective Teaching, expanded services for disabled students and the addition of the McDonough Sports Complex, Cogan Hall, Fitzgibbons Health Technologies Center, the Hy Rosenblum Administration Center and the Bulmer Telecommunications Center were accomplished during Bulmer's presidency. Dr. Stephen Curtis came to Hudson Valley Community College after serving as interim president of Borough of Manhattan Community College. While at Hudson Valley, Dr. Curtis led improvements to the college's distance learning program and helped link the college to several high schools around the region through interactive television. Dr. Curtis currently serves as president of the Community College of Philadelphia. The only alumnus to serve as president of Hudson Valley Community College, John Buono had a lengthy career in public service before accepting the offer to serve as interim president of his alma mater. Buono served as Rensselaer County Executive from 1986 to 1995 and was then tapped by Governor George Pataki to head the New York State Dormitory Authority, where he served as director for three years. Buono's tenure as president of the college saw the creation of the Viking Child Care Center, Guenther Enrollment Services Center and the Joseph L. Bruno Stadium. He also established the college's Workforce Development Institute, which provides non-credit, customized training for business and industry. He currently serves as chairman of the NYS Thruway Board of Directors. Prior to serving as interim president, Dr. Silvestri served as the college's vice president for administration since 1984. During Dr. Silvestri's tenure, the college received reaffirmation of its accreditation by the Middle States Association of Colleges and Universities. “Drew” Matonak assumed the presidency on April 18, 2005. Prior to arriving at Hudson Valley, he served as president of Northwest Iowa Community College in Sheldon, Iowa, for three years. Matonak announced in April 2018 that he would retire prior to the 2018-19 school year. Ramsammy assumed the Presidency in July 2018 after previously serving as president of Miami Dade's West Campus and Northern Virginia Community College. Dr. Ramsammy previously served as a faculty member, department chair and dean at Palm Beach Community College. As president, Dr. Ramsammy has outlined several chief goals: Fostering the Power of Mentorship and Community; Driving Workforce Partnerships and Serving our Region; Building a Strong K-12 Pipeline to Higher Education and Careers; and Developing Strategies to Help Underserved Students Succeed. Maureen Stapleton Theatre – The Maureen Stapleton Theatre, dedicated in 1981, seats 350 people and is located at the north end of the Siek Campus Center. The space was named after the Academy Award-winning actress who was a native of Troy, New York. Sculpture on campus – Two pieces by noted American sculptor Antoni Milkowski are sited on the campus. The college obtained Runner, which consists of a series of seven shiny stainless steel cubes, in 2009, as a gift from the Milkowski family. It is located in a new quad near the entrance to Administration/Classroom Building. 1971 AD, has been on view in front of the Siek Campus Center since the college's 25th anniversary. The large, cor-ten steel sphere was a gift from the artist who lived and maintained a studio for many years in New Lebanon, New York. Teaching gallery – the college's teaching gallery is located in the Administration/Classroom Building and home to the college's Gallery Management degree program. The gallery also displays exhibits by several regional and national artists each year. The TEC-SMART Facility located in Malta, New York. Albany Center for Education – Hudson Valley Community College operates an extension center at 30 North Russell Road in Albany. The extension center, now named the Albany Center for Education, has served as the Albany location of the Capital District Educational Opportunity Center (EOC) for several decades. Hudson Valley, which administers the EOC, also now offers credit-bearing college courses, along with credit-free career training through its Workforce Development Institute at the site. TEC-SMART (Training and Education Center for Semiconductor Manufacturing and Alternative and Renewable Technologies) – Opened in January 2010, the TEC-SMART facility is a joint initiative between the college and NYSERDA (New York State Energy Research and Development Authority). Located in Malta, New York’s Saratoga Technology and Energy Park, the building houses the college's training classrooms in semiconductor manufacturing technology, as well as labs and classrooms for training in renewable energy technologies such as solar, wind and geothermal power. TEC-SMART is also home to the Clean Technologies Early College High School program, a collaboration prepares high school students from around the region for college and careers in the fields of energy efficiency, renewable energy and advanced technology. A science center on campus was completed in Fall 2013. The building houses laboratory and classroom space for the college's science programs and support degree offerings in biological sciences, biotechnology, physical science and environmental science. Expected to be open in Fall 2019 is the Gene F. Haas Center for Advanced Manufacturing Skills. ^ "HonorScholar Program at Hudson Valley Community College". www.hvcc.edu. ^ "Official Athletics site of Hudson Valley Community College". HVCC. ^ Bump, Bethany. "HVCC Names its Next President". Times Union. Albany Times Union. Retrieved August 4, 2018. ^ "An immersion in science for students at HVCC". 29 August 2013. This page was last edited on 3 April 2019, at 05:18 (UTC).